Remember the “good old days” of lead gen when all you needed were flashy red banners, promises of free computers, and sketchy sign up forms? With half a marketing brain, you could make leads fall from the sky. Thankfully, those ridiculous days are over. Consumers are getting smarter and have high expectations for your brand, and as a marketer, it’s your job to do the wooing. Luckily, that’s also what makes your job fun. Lead generation is all about connecting brands and audience. These 50 posts will teach you how to do it right. Solve a key problem, and your customers will like you better. Content is the web’s most powerful match-maker, and here is some data that explains why. Quit over-thinking your content. All you need is an old-school mad lib to be a rockstar writer. Seriously though, when you write relevant content, leads will flock to your sign-up form. This post will squash your excuses for why you can’t blog. Word on the street is that content marketing costs less per lead than paid search. You spend hundred of hours writing blog posts that generate zero leads. Ouch. Here’s what you’re probably doing wrong. Wow your visitors with an all-in-one white paper, webinar, and slide deck. Like this idea? Click through for five more. You sat down to start. Five hours later, you’re procrastinating by reading this blog post. That’s precisely why we linked to this eBook. Time to kick it up a notch! Blogs will improve your search visibility and attract readers, but at the end of the day, your posts need to pay. Bad rhyming aside, here’s how to hit a content home-run. Scroll down to section four, and read about the ‘free product’ model. Then, read everything else. Need one or two lead gen ideas? How about 49? Thank you, Sonia Simone! Here’s how to kickstart a solid commercial relationship with your readers. We know that the expression is cheesy, and yet, it makes way too much sense. Before you write out your next blog post, map out your content marketing sales funnel. Here’s how. Link overload, bad calls to action, and confusing content will scare away any prospective customer. Your awesome content isn’t converting anyone. What’s wrong? Find answers here. When running paid campaigns, do you send most of your traffic to your home page? If so, keep reading because you probably need to change your strategy. 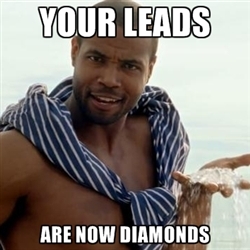 You have leads, but are they sales-ready? Here’s how to tell. Stop harassing leads that don’t convert. Make sure that you make the most out of all traffic that comes to your site. Use empathetic photos, and don’t be afraid to stand out from the crowd. Can you tell a good lead from a bad one? When was the last time that you organized your messy, messy database? Here are nine mistakes that you need to stop making today. Oh, they’re bad. Real bad. Read until you can’t take it anymore. Are you pushing or pulling your customers? The answer to that question is mission-critical. 21. Are Your Lead Generation Tactics Targeting the Wrong Buyer? You’re selling clothes to 20 year old women, so why does your landing page feature an 80 year old man? If you’re second-guessing your answer, you better read this post. Birthday marketers aren’t fooling anyone. Here’s a breakdown of the good, bad, and ugly. Here’s why your social media campaigns are falling flat. If you’re sales and marketing efforts are two codependent, you’re probably doing something wrong. The relationship should be harmonious, not intrusive. Think that everyone wants free stuff? Think again. Freebies are getting tougher and tougher to give away. Keep reading for more counter-intuitive tips. Every great promotion comes to an end, right? Nope. Repackage your offers to drive more sales. Why your best customer is your best sales rep.
Best practices for balancing your technology and marketing strategy. Believe it or not, there is more to the world than the Internet (gasp!). Learn about how “the penny hoarder” used a bumper sticker to build traffic. Read this article, and you’ll realize that opportunity is truly everywhere. How to make the most of the world around you: segment your database, create partnerships, and develop a referral strategy. Don’t let the title deceive you. This four-year-old blog post is convenient, quick, and easy-to-scan. “Your leads are only as good as the website that produces them.” True story. Here’s how to rock your emails and newsletters. 36. What are Some Good Examples of Lead Generation Activities for B2B SaaS Companies? The Quora crowd weighs in. Your landing page is a critical step for generating leads. Here are some tips for building the best one possible. A technical look at managing your leads. Have a solid campaign goal. Best suggestion ever. Little changes have big results. Here are seven to get you started. If you’re generating leads through your LinkedIn company page, make sure that you give this post a read. By 277% say recent reports. The best way to get people to share your content? Make them laugh. At the end of the day, social media is about results, not shares. Here’s how it all fits together. Three timeless principles: engage, monitor, and share. Here’s what you do when you think you’re running out of ideas. When you set up your numbers, make sure you do it right. Don’t worry, next time will happen sooner than you think. If you’re a B2B marketer who isn’t using Quora, you seriously need to start. There you have it — 50 of the web’s most awesome perspectives on lead gen. Do you feel like a smarter, more sophisticated marketer? Share your thoughts, and we’ll leave you with a virtual high-five. Ritika Puri is a Los Angeles based marketing and business blogger who writes about trends in data, internet culture, and entrepreneurship. She's inspired by the intersection between technology and sociology.